By default Windows has a simple tool that allows us to format drives easily from the file explorer, however, this tool is quite limited for users working with partitions and drives in different formats, So in these cases you must resort to third-party applications that do allow working with disks and partitions format. It is one of the best disk partition software for windows 10, 8, 7, server. 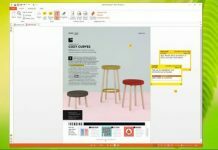 Which is the Best partition software for windows 10? One of the best programs to handle partitions in any environment is partition assistant from AOMEI. The program makes it possible to do almost anything about a partition: resize, move, merge, hide, activate, convert partitions, etc and that’s why we recommend the AOMEI Partition Assistant. Get this free partition software. It is also capable of erasing the disk, defragmenting it and even recovering deleted partitions. That yes, remember to make a backup when you intend to perform this type of operations. Although these programs minimize risks, there is always a slight exposure to data loss. 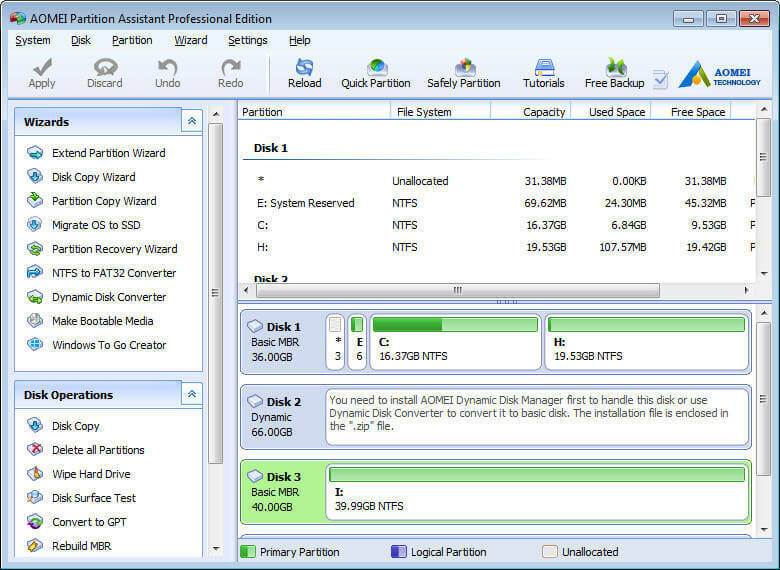 AOMEI Partition Assistant is a free tool designed to work with partitions easily on a Windows operating system. This tool is fully updated with the most widely used partition tables and file formats so that this software is compatible with all current hard disks on the market regardless of their default partition table (GPT or MBR) and with all Most commonly used file systems (NTFS, FAT, etc.). The Standard version is free, the rest paid. The operating systems supported by the free version are: Windows 10/8.1/8/7/Vista/XP (32/64-bit). If you have a server operating system, I recommend you use the Server version (unfortunately it’s not free). In this article we will explain the operation of AOMEI Partition Assistant , a free tool for Windows users that allows working with hard disks and partitions easily either to format or to delete partitions or create new ones on disks and drives connected to our PC. This tool is ready to run on any modern version of Windows (even in Windows 10) and has a number of options and features to work with SSD drives. Partitioning a hard disk not only prepares it for its general operation (which also requires a format) , but also represents a strategic decision . These days, hard drives have impressive storage capacity, so it may be much more practical and safe to divide that space into several logical drives. Another benefit of partitions is the ability to easily configure multi-boot environments . As an example, if a user wants to keep their original installation of Windows 7, but at the same time wants to have Windows 10 and a Linux distro, simply change the size of the initial partition, create the new partitions, And install each operating system in order . 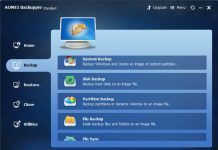 Using a good windows partition tool is vital , and fortunately there are several tools with wide compatibility and robustness. Before using this tool we must download and install it on our computer. As we have already said the application is completely free and can be downloaded at no cost. You will also see the “Pro” and “Server” versions of the tool and come with additional functions specially designed for advanced users. Once downloaded the free version is installed simply by following the wizard that appears to us. The application is free of advertising and unwanted software so we do not have to worry about this. Once the installation is complete, the application is ready for use. When opening for the first time in program we will see an easy, clutter free interface. Extend, copy or move partitions. Migrate the operating system to another disk. Move from NTFS to FAT32. Create, delete or check a partition. Mark a partition as active. Change the drive letter and label. Once you have chosen what you want to do, simply click on the “Apply” button in the upper left of the window and check that everything is correct and corresponds to the unit you want to format and the desired format. We confirm and wait for the changes to take effect. Once the process is finished we will have our unit as new and ready to start working. AOMEI Partition Assistant is an excellent free tool for the management of hard disks and partitions, however during its use we have found a series of aspects that we have not finished liking. The first is the number of file formats supported. This tool has the basic formats like Fat32, NTFS, EXT2 and EXT3. This tool is one of the most secure and stable in the market and works perfectly for those users who have special needs in the management and formatting of hard disks. What do you think about AOMEI Partition Assistant? Do you know or use other applications to format your hard drives? Which is the Best partition software for windows 10? With AOMEI Partition Assistant we are again with a complete suite that offers its basic functions and some surprise in a freeware version. With it we can perform all the operations we need to partition, copy partitions or hard disks , create boot drives and convert MBR format partitions to GPT.